This weekend sees the first display of shooting stars as the Quadrantids meteor shower takes centre stage on Saturday night/Sunday morning (3rd/4th January). Watching for bright meteors is a very popular activity for stargazers as no expensive or complicated equipment is needed to enjoy a meteor shower and like a solar or lunar eclipse, it’s fun to enjoy the spectacle with other observers. Under very good observing conditions from dark sky locations the Quadrantids, their radiant lying in northern Boötes, can produce up to a couple of meteors a minute and initial indications for the UK is for a favourable weather forecast for a frosty night, with some substantial gaps in any cloud cover at the very least. Unfortunately, the glare from the near-full moon in northern Orion, which is above the horizon all night, will hamper observations, wiping out the visibility of fainter meteors. 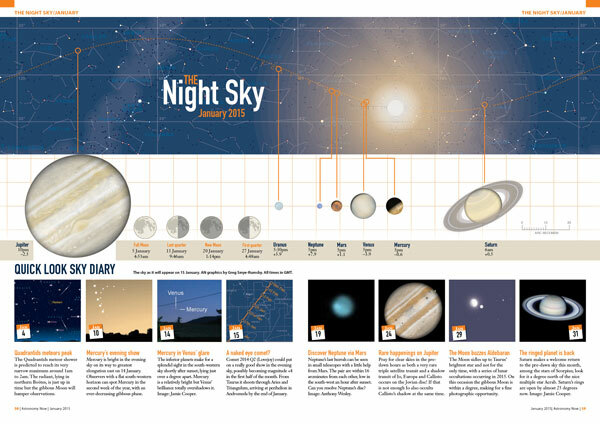 The Quadrantids are predicted to peak in the hours between midnight and 2 am GMT, with a short, sharp maximum, with best activity confined to a six-hour period within their normal limits of 1st-6th January. There is quite a wide disparity in the quoted zenithal hourly rate (ZHR) — the probable number of meteors observed per hour from a shower having its radiant at the zenith — with figures as high as 120 or as low as 60. As the evening wears on the radiant will steadily climb to be 30° or so up in the north-east at midnight. From North America the peak will occur around 9 pm EST, but at that time the radiant is very low on the northern horizon. The best bet is to observe the shower between midnight and 2 am when the radiant is around 30° above the north-eastern horizon (New York latitudes). As the radiant steadily rises this helps the meteors visibility over a bigger area of sky, albeit with rates declining in theory as the predicted maximum passes. Nevertheless, one can never be 100 percent accurate when predicting any meteor shower, so it’s well worth staying up for as long as possible; at least you can have a lie-in on Sunday morning! The radiant lies in northern Boötes, east of Alkaid (eta Ursae Majoris), at the end of the Plough’s handle near the shared border with Draco and is circumpolar from the UK. 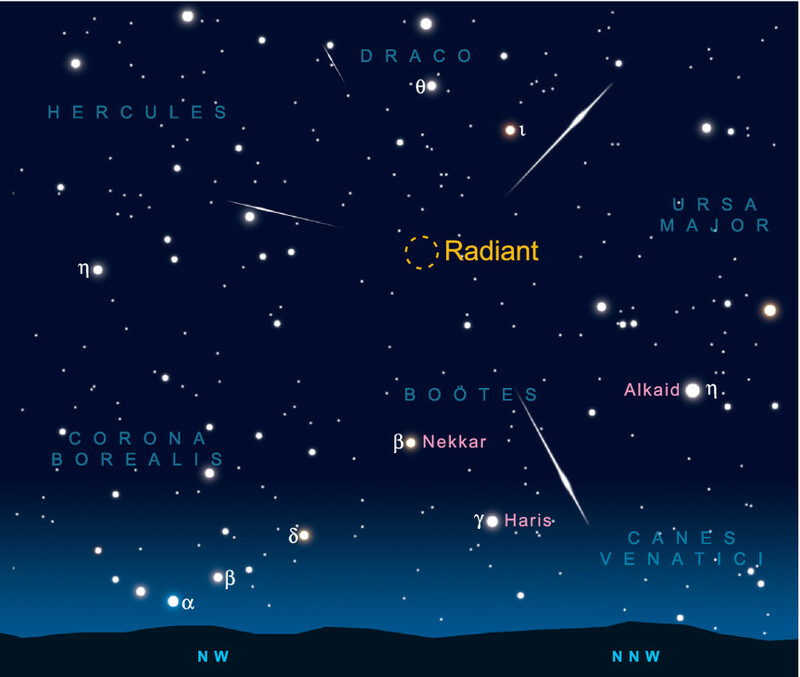 The reason why the shower is named the Quadrantids is that this area of the sky used to be known as Quadrans Muralis, a now defunct constellation covering the area between the right foot of Hercules, the left hand of Boötes, and Draco. It was introduced in 1795 by J. Fortin, maker of globes and spheres for the French royal family. The figure represented the mural quadrant of Joseph Jérôme de Lalande, the eighteen century French astronomer who charted 50,000 stars with the quadrant while at the collège de France. He took his inspiration from his countryman Nicolas Louis de Lacaille, who charted the southern skies some years earlier, inventing many of the southern constellations still in use today. Quadrantids meteors are slow to medium speed, around 43 kilometres/second, compared with 35 km/s for Geminids and 71 km/s for Leonids. Around 10 percent leave a persistent, glowing trail or train, with the brighter ones often appearing blue and yellow. Like the Geminids, the shower appears to be produced from the debris of an asteroid (2003 EH1), possibly the extinct nucleus of a comet that broke up centuries ago. 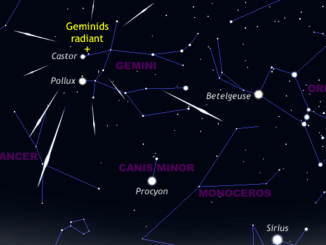 The December Geminid meteor shower is generally regarded as the richest and most reliable of the major annual shooting star displays. This year the predicted peak occurs close to 12h UT on 14 December, though high rates of activity should be encountered between 8pm GMT on Thursday, 13 December and 5pm GMT the following evening. Astronomers have uncovered evidence for a vast collection of young galaxies 12 billion light years away. 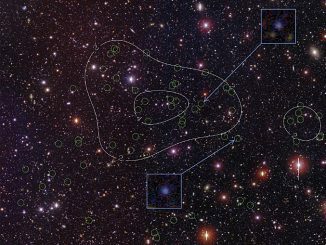 The newly discovered “proto-cluster” of galaxies, observed when the universe was only 1.7 billion years old (12 percent of its present age), is one of the most massive structures known at that distance. 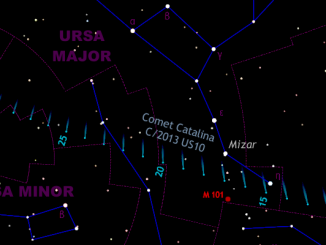 Having brushed by bright star Arcturus on 1 January, Comet Catalina (C/2013 US10) continues its trek through the constellations of the far north. Now a circumpolar object for the British Isles, in the early hours of 17 January it lies between famous double star Mizar (ζ Ursae Majoris) and the Pinwheel Galaxy (M101), virtually overhead in the UK.